Going through weekday blues? It’s time to take the boredom out and make it a super exciting week. Droom, India’s first online marketplace to buy and sell automobiles, is coming to your city – Chandigarh with once-in-a-lifetime opportunity. This Wednesday, 28 October 2015, get ready for an intensely thrilling experience at your doorsteps. Once again we have partnered with Uber to present “Supercars on Demand”. After delighting Delhittes, we are driving to towards fun-loving people in Chandigarh. 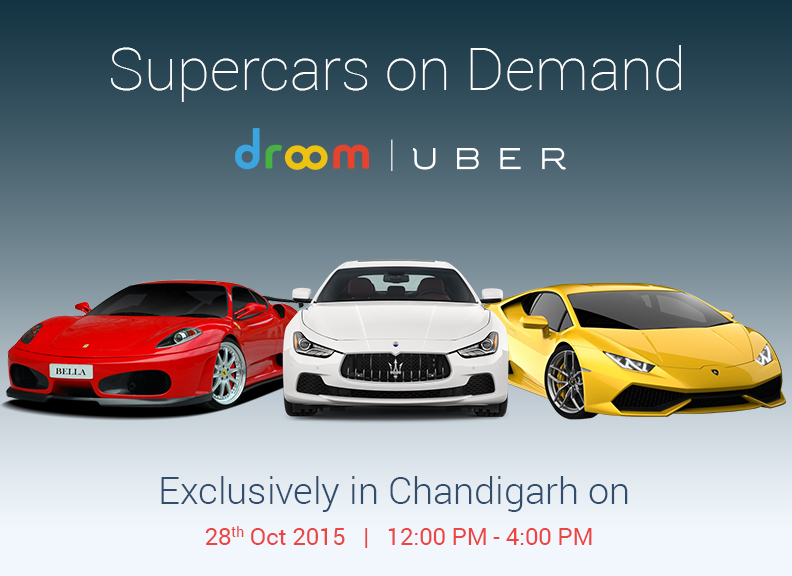 Droom and Uber are coming to Chandigarh to make some unforgettable memories and deliver unforgettable experiences like never before. All people out there, all you have to do is get on the Uber App between 1 pm to 4 pm on 26th Oct. ’15 and tap on the slider to get your dream ride on demand and allow us to sweep you off your feet as you speed away. Show off your “tashan”, cruising down the roads in a super-classy supercar. Don’t miss your chance to have a world-class experience with Uber and Droom. You can catch up all the fun live which would be posted on Twitter, Facebook, and Instagram pictures and videos with these supercars. Use the hashtag #UberSUPERCARS and tag @letsdroom in all your posts. There are lot more surprises waiting for you. Fasten your seatbelts to enjoy a fun filled joyride in a luxurious car. Droom holds largest collection of supercars, premium cars, superbikes, motorcycles, and more in India. Scour droom.in to shop anything from bicycle to car to auto warranty and inspection. Make sure you don’t forget to check biggest festive flash sale on largest collection of used motorcycles and scooters, starting 30th Oct 2015. This will be valid for limited time only. So hurry up! T&C Apply:- Please note it will be a 15 minutes joyride, and we would drop you back to your original location after the ride. You would not be allowed to drive the car. Demand would be high, and availability low, so we request you to be patient. Droom Navratri Special Sale Open For All! Droom Now Available in Punjab!